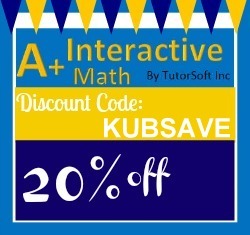 As you know our family uses and loves A+ TutorSoft's Interactive Multi-Sensory Math. 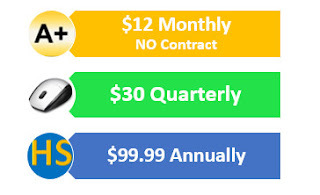 I loved A+ TutorSoft so much that earlier this year I began working for the company and now handle the social media and blogger relationships for them. The A+ TutorSoft team has been working very diligently over the last few months on several tasks...like a relaunch of the NEW and improved A+ TutorSoft website as well as updates to several products. To celebrate this relaunch as well as the start of a new homeschool year, we are having a HUGE party on the A+ TutorSoft Facebook Page on FRIDAY August 16th (RSVP here). 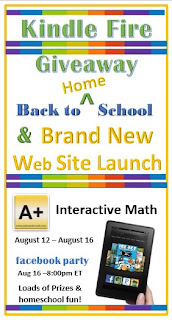 A+ Interactive Math by TutorSoft Inc. is giving away a Kindle Fire as well to celebrate the launch of the brand new website. The Kindle Fire will be loaded with 8 different A+ Interactive Math eBooks for a value of almost $300 total! Kindle Fire is also compatible with the hundreds of A+ worksheets, so you can take math on the go. 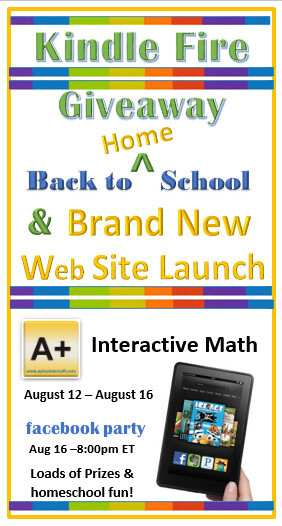 The new website, launching this week, promises a whole new look and feel offering a brand new A+ math experience. The site launch is only a portion of the exciting new changes coming from A+ Interactive Math. There are new programs, books, eBooks & more options coming to help every homeschool family afford a top of the line math curriculum. The A+ Homeschool blog has recently launched, and although A+ is a Math Curriculum company, the blog serves to support and inform homeschoolers with freebies, deals and news to make their homeschool journey a great one. This giveaway promotion sponsored by A+ Interactive Math, will run from Aug. 12 – Aug. 16 ending with an incredible Facebook party on the A+ Facebook page. There will be exciting door prizes for everyone who attends, as well as over $1000 in fantastic homeschool giveaways. Sponsors include: A+ , Master Books, EEME, Winter’s Promise, Founders Academy, How to be Homeschooled, Tangram Chess, Kathy Lee – Homegrown Preschooler, HEDUA, CurrClick, AJTL lapbooks, Family Time Fitness, Educents, Brimwood Press, Unit Studies by Amanda Bennett, Heritage History, Creating a Masterpiece, & Bright Ideas Press and more! Please visit the new website A+ Interactive Math and leave a comment below sharing your thoughts on the new design, or about a product that interests you. Open to US & Canada only. A Canadian winner must agree to pay up to $35 in shipping or forfeit to another winner. Entering the giveaway is always free. Valued at almost $400! would love this as is my first year homeschooling and need all the help and advice I can get! I love the pre-algebra worksheets... #31 - Order of Operations! so many wonderful worksheets! thank you for pointing us to them. What a wonderful giveaway! Good luck everyone! Oh and love the math worksheets! MATH worksheets, for really reals! SO need more of these!